Most content blockers use and load filter lists that include instructions to block or change certain content on visited sites in the web browser by default; this is done to ensure that default configurations do block a good chunk of unwanted content right away. Most extensions support custom lists and individual filters. Users may load custom lists in most extensions and add their own filters to the list as well. The exploit uses a filter option called $rewrite that Adblock Plus supports to inject arbitrary code in web pages. The $rewrite filter is used to replace code on sites by rewriting it. The filter option restricts the operation; it is designed to load content only from the first-party source and not third-party sites or servers, and some requests, e.g. script or object, are not permitted either. Origins cannot be restricted on the page, e.g. by using Content Security Policy directives, and the final request URL cannot be validated before execution. The origin of the code must have a server-side open redirect, or must host arbitrary user content. Properties that match all three requirements include Google Maps, Gmail, or Google Images among others. A proof of concept was published on the author's website and you may try it on Google Maps to verify that it works. I tried the exploit in Chrome and Firefox, and could not get it to work. Lawrence Abrams over on Bleeping Computer managed to get it to work though. The attack has another requirement, as it relies on filters. A manipulated filter needs to be added to the list of filters used by the content blocker. The two most common options include users adding filters manually to their content blockers, or that a manipulated filter is on a filter list that gets loaded. The second option seems more likely, especially in cases were users load other lists in the extensions. It is not the first time that lists get manipulated but it does not happen very often. The extension uBlock Origin is not affected by the issue as it does not support $rewrite. Who uses this junk extension anyway? They are being bribed by the ad industry to let certain ads through, they call that “Acceptable Ads”. Use uBlock Origin, folks. It’s not compromised like AdBlock Plus is. I don’t take too much issue with the former point, but with the latter. I do not think that it is great when an adblocker(!) lets ads through in the first place, BUT requiring payments from the advertisers for the ads to be whitelisted is extortion. Some companies (their “esteemed partners”) play along with that business model, others don’t. I only respect those who don’t. 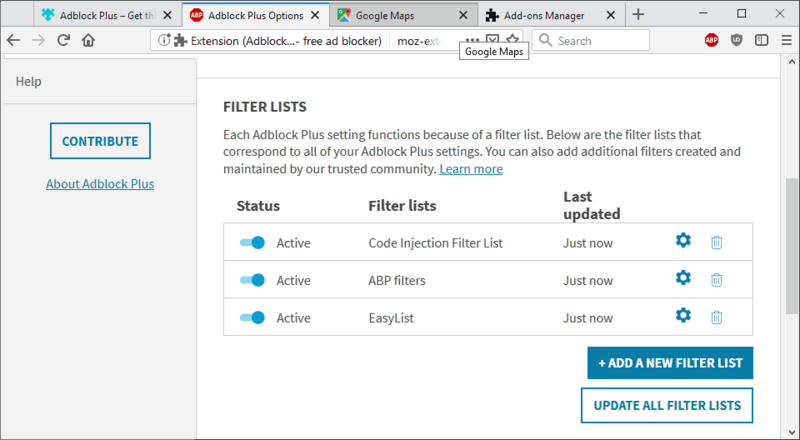 Only those who have installed the uncommon Code Injection Filter List to Adblock Plus are vulnerable to the bug which is seldom being exploited in the wild = this issue does not affect nearly all Adblock Plus users. Thanks for speaking on behalf of nearly everyone, always nice. With NoScript & AdBlock I never have any problems on sites (using a portable firefox). Btw I long ago disabled Adblock & NoScript on Ghacks to help Martin earn from this site, but nothing ever changed. I never see adverts nor have popups into other sites. Maybe it’s because my portable Firefox has been running since version 1.something & certain rules don’t get cleaned out ? It’s annoying as I don’t mind having ads in here if it helps Martin continue the site. > It’s annoying as I don’t mind having ads in here if it helps Martin continue the site. I do. I’d pay a few $$ per month for gHacks, if that means that there are no ads or trackers on the site. Privacy is of higher value than a few $$ for me, therefore I refuse to support any tracking or ads, even if the site is nominally for free. is right that only who has the Code Injection Filter List to Adblock Plus are vulnerable to the bug? No, it can be in any list but is in none that Adblock Plus loads by default. Extensions seem to be the target of choice now that plugins are gone. For me there is enough issues with browsers that adding extensions just adds another layer of potential exposure. Ads really do not bother me much, I get its a tradeoff for access to a web site for free. Yeah a few sites are over the top in placing annoying ads so I tend to avoid them. Seems like all these ad blockers eventually do white lists deals in order to survive because while users seem to love to block ads, they seem unwilling to support the developers who make the blockers. Brave browser has a interesting take on ads, but I doubt it will catch on. But its built in ad blocker seems to be a better option then a extension. If you consider ‘uBlock Origin’ it’s the developer himself who made it clear ever since he launched the extension that he’d refuse any form of financial support. Money helps as well as it corrupts, see ‘Adblocker Plus’ and its ‘acceptable ads’ on the ground of acceptable advertisement funding. Considering the idea that because Web sites are free to access and provide (for most of them) free blogs, data, services it is normal to pay our part by allowing ads, it’s unfortunately more complex than simply accepting ads on a page : think malvertizement, think tracking. We’re not in the 1950’s advertisement scheme, things have changed, targeted ads were invented to increase the ROI and take full advantage of the Web’s very structure : following everyone everywhere. Considering the idea of participating to the cost of a website, my opinion has always been that a website should not represent the income of a site administrator. You earn your life elsewhere and if you have the time and can afford it you open a website. Otherwise why not consider that if we don’t give a dime to a street artist we should as well pass our way? There are many areas in life we’d all like to make a living but am I authorized to require money on the ground I’m willing to earn my life with what I’m fond of? From there on I consider participating nevertheless to the cost of websites I regularly visit (hence I like) by direct funding (as here with ghacks.net) but will never accept ads for the sake of a site’s accessibility because and please pardon this analogy : prostitution, be it mental, is not my cup of tea. But I am not against the principle of advertisement should advertisement be and be only a source of information for a given product, free of subliminal and targeted processes, healthy, respecting the users, less and better and e all know that’s not how it works. Feed forcing is the adverisement business’ credo, conceived as a war so war they have : adblockers. Period. This is a fake scenario just to harm ABP. This is not fake but not actively exploited and it seems unlikely that it will. Still, the article you linked to state that $rewrite will be removed in future versions. I have updated the article to reflect that. The ABP guys are wrong. As long as the technical possibility exists, the situation isn’t optimal. Even though the threat is probably only theoretical, it reflects how careless the ABP people are about their software. The threat was well-known in the circle, and additionally it seems there is no good reason to use that feature at all. It’s simply laziness on the part of Eyeo who controls ABP, Adblock and uBlock. You can bet the Eyeo people are not using ABP themselves. Eyeo GMBH only owns ABP. AdBlock and uBlock non-Origin seems to be owned by a mysterious and anonymous business man, while uBlock Origin is owned by one enthusiast guy from Canada. Seems, the $rewrite filter option is useful to some users in blocking the anti-adblock warning messages of restrictive websites who want to force their ads on visitors, eg China’s Youku, qqdotcom, etc. To the degree that I currently understand the exploit, an entry using the sort of syntax that is used in the exploit example list, has never been used in the ~309 different ABP-format lists that are currently known to exist. So there’s very little to fear, as it currently stands. However… even if ABP was to patch this really quickly, it appears that among those very-low-quality adblockers that fill up add-on stores, those that were forked from ABP or AdBlock between July 2018 (when “$rewrite” was added to ABP) and this week could remain indefinitely susceptible to this due to their lack of attention to their own coding. Mysteriously, 13 million Dollar expenses appear in the Eyeo financials the year that Adblock gets bought by an unknown buyer, and immediately after Adblock starts to participate in the Eyeo acceptable ads program. uBlock was also bought by an unknown buyer, but Adblock registered uBlock as a trademark in Germany, accidentally the home of ABP. There is only one big corporate player in the field of ad blocking. They do not disclose this due to anti-trust issues with one big player controlling 90% of the ad business, and google is by the way their biggest customer, buying access to their users. Hmm… with that kind of evidence and indicators, that actually does sound pretty plausibly believable. Even I who tend to be fairly deep into the uBO community was unaware of gorhill having tweeted about that, so I thank you for sharing this info with us. It states on the site you linked to Martin that the exploit can be mitigated by whitelisting known origins using the connect-src CSP header, or by eliminating server-side open redirects. However, it doesn’t explain how to do that. Any ideas on that anybody? This implies that it doesn’t affect my installation since I’m running version 2.9.1. I just didn’t like the web UI in later versions of APB and decided to stick with the previous one instead. This version is also the last one which supports the Element Hiding Helper which I use a lot. Thanks very much for explicitly noting that uBlock Origin is not affected! So does anyone have any opinion on AdBlocker Ultimate, or is it also affected, or for some other reason a bad choice?? Taking a quick look at Adblocker Ultimate’s settings menu and interface, I would advise against using it. Judging by the UI, AdUlt appears to have been forked from AdBlock in 2016 or 2017, and has not updated its included filterlists to reflect when lists have ceased to be maintained (e.g. Norsk Adblockliste, Fanboy’s Swedish, Juvander’s infamous Finnish List), nor does it have an option to show links to the lists. I therefore personally recommend that any and all users of Adblocker Ultimate who likes its UI, should under normal circumstances change to AdBlock, whereas those who use AdUlt and thinks of it as inadequate, should change to Nano Adblocker or uBlock Origin.